"If there is a new world that can be created by my sword, a world where anyone can live peacefully and without fear, if my arm can create that world... I will. I will serve as Heaven's justice, and I will kill." The late 1800s were a transitional period in Japan, as the shogun era drew to a brutal close with the installation of the Meiji Ressurection, which displaced the caste system that had been in place for hundreds of years during the Tokugawa Period. Under the caste system, the shogun, daimyo (provincial rulers) and their samurai armies were the upper class, with farmers and peasants next in line, followed by artisans and finally merchants. With an increasing influence from the western world, this system became unstable, as the merchants and farmers began to wield more wealth than their rulers. The samurai, who had previously been maintaining order through military reign, began to feel betrayed by the weakness exposed by their government, and mounted an uprising to cleanse the country and return Japan to a proud and powerful nation. Based on these historical events, Rurouni Kenshin (North Americanized as Samurai X) follows the story of one young samurai warrior as he makes the transition from the past into a new future for Japan. This disc, and the following Rurouni Kenshin (Samurai X): Betrayal, contain the four OVAs that are prequels of a sort to the extremely popular Rurouni Kenshin TV series. As the story opens in 1864, a young boy named Shinta (Masami Suzuki) witnesses the brutal slaying of a group of peasants that he has been sold to as a slave after the death of his parents. Just as Shinta is about to be executed, the bandit attackers are slain by a lone swordsman who appears out of nowhere. Filled with vengeance, yet with a hope for an end to the violence that plagues his country, Shinta is taken into the mentorship of the swordsman, Hiko (Shuichi Ikeda). A lethal assassin, Hiko has been trained in the ways of the Hiten-Mitsuragi. Feeling Shinta is too juvenile a name for an assassin, Hiko renames him Kenshin, and pledges to teach him all he knows of the ways of the sword. 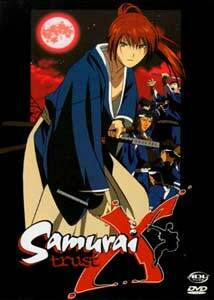 The story then moves forward to a time when Kenshin Himura (Mayo Suzukaze) meets up with Katsura Kogoro (Tomokazu Seki), a nobleman on a mission to bring a new order to Japan with the beginning of the Meiji Resurrection, which has the extermination of the old Tokugawa Shoganite at its heart. Kenshin becomes a secret assassin for Katsura, with a talent for swordplay that is unrivaled, save for a single warrior who leaves a lasting wound on his left cheek prior to being dispatched. Flashbacks to Kenshin's training and his eventual parting from Hiko are interwoven with his meeting with Tomoe Yukashiro (Junko Inao), a young girl who witnesses one of Kenshin's bloody murders. As the Meiji Resurrection begins to take place, each character's part in the saga unfolds, and the alliances that will bring about a major change in Japan begin to solidify, though their basis may be as unstable as the system they are living under. The animation in these two episodes features rich and detailed backgrounds, which form the backdrop for the fluid, and very bloody fight sequences. Kenshin's Japanese voice actor is a woman, which contrasts nicely his persona as an assassin, causing his unsuspecting victims to underestimate his incredible skill. The style of character design and the accompanying backgrounds are wonderful, and the storyline is full of action and intrigue. The primary criticism of this release is the renaming of the series, and the English intertitles which are stylistically obtrusive in relation to the original Japanese animation. The level of graphic violence in this series justifies ADV's suggested 17+ rating. Image Transfer Review: Video quality is extremely good, with only a few minor instances of artifacting. There is some aliasing in a few scenes, but in general the presentation is exceptional. The exquisite backgrounds are well-rendered with rich and vibrant colors, and the many night scenes are also solid in their black levels. While the copious amounts of blood in these two episodes is not as rich as it might be, the overall appearance is first rate. Audio Transfer Review: Audio is presented in stereo on the original Japanese track and the English dub. Both tracks offer some directionality for off-screen actors and Foley effects. Dialogue is for the most part clear and well presented. The features can be viewed with or without English subtitles in both languages. Extras Review: Each episode is chapter marked by opening and closing credits, plus actone and two. Credits for both the Japanese and English voice talent rollover the end credits. Like several other ADV discs, Samurai X (Rurouni Kenshin):Trust features six front end preview trailers, which can beskipped by pressing either the chapter advance (to move to the nextpreview) or the menu button to get to the main menu. The quality ofthese previews exhibits some interlacing, though they are generallypretty good. Included are Ninja Resurrection: Hell Spawn,Generator Gawl Volume 1, Gasaraki,Blood Reign: Curse Of The Toma, Sin: The Movie andan ADV mix trailer. I would prefer these were instead included as menuselectable extras, as you must skip them each time the disc is loaded.The included insert card incorrectly lists the titles previewed. We also get character profiles which also include optional clips fromthe two episodes showing the characters. These profiles do containpossible spoilers. In addition, a section on the historical referencesare included as scrolling text, though I found I had to pause thisfeature in order to keep up with all the writing, as it scrolls quitebriskly and the typeface isn't the easiest to read quickly. Theimplementation of this latter feature could use some refinement, but itscontent is quite interesting. The only trailer actually accessable from the menus is for theRurouni Kenshin OVAs, which pleasantly, are titledcorrectly without the name Samurai X anywhere. ADV has also wisely chosen to address those upset by the renaming of theseries in North America by including a reversable cover for the disc,which eliminates the Samurai X designation in favor of theoriginal Rurouni Kenshin title. The first of two discs that make up this set of four Rurouni Kenshin (Samurai X) OVAs is well presented and the story is engaging and brutally graphic. The animation is beautiful. ADV's additions on this disc, including the reversable cover show a concern for detail, though I would really prefer the front end trailers be dropped for menu accessable versions. I liked this more than I thought I would, based on the samurai theme, and with the low disc count for the complete set, I can safely recommend these as a worthy addition to any anime collection.